On the 2nd of October 2015, this session’s orientation and induction ceremony was held, and after weeks of skill training, 185 students made it to the final day! 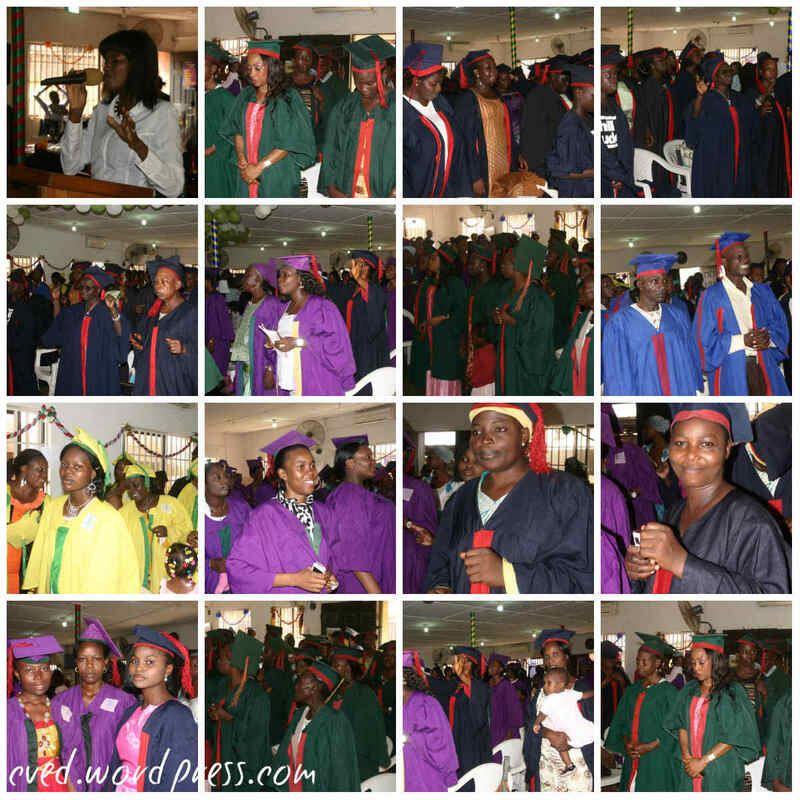 On the 18th of December, in the Dominion Faith International Church auditorium, the 18th CVED graduation ceremony was held! 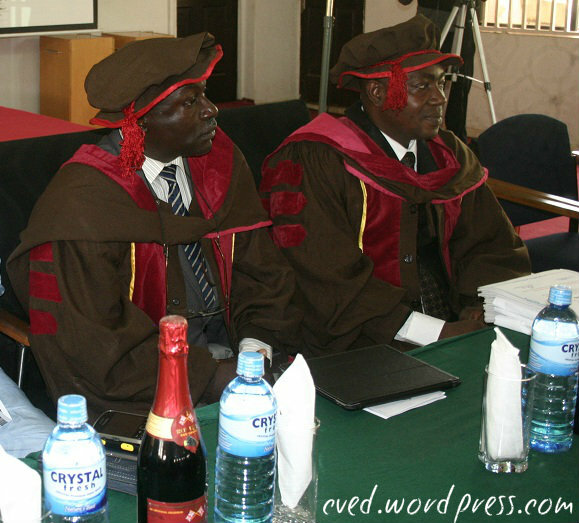 It was indeed another colourful ceremony as Pastor Jide Esan (the CVED Coordinator) welcomed all graduants and guests to the event. In his opening speech, he said he knows that many would have been asking how we have done this for years free of charge! He stated that our driving force is the vision of the church and also of the organisation (CVED) – to raise economically self-reliant individuals and leaders. He congratulated the graduants for the successful completion of their respective vocational training. Pastor Nicholas Uanikhoba read the CEO’s speech, and on behalf of Rev. David Olatona who was unavoidably absent enjoined the new graduants to start up something with their newly acquired skills and encouraged them to be masters of their trade. Mr. Adeniyi Akomolede delivered the first speech; encouraging the graduants the ideas rule the world. The skills they have just acquired are not new, but if they must go into business with the skills, they must stay true to their trades be innovative with their products. He told them that the training is like a seed in their hands that they must grow and must make attractive; this in turn will help them make impact. After his speech, he presented certificates to graduating Chemical Production students and the only graduating student in the Photography and Video editing class. The second speech was given by Mr. Damilola Adeoti. He told of his story – how he did not start as a CEO, but is now a CEO. He talked to the graduants about believing in themselves, being hard workers, being honest with their clients and succeeding in the end! He also encouraged them to develop saving habits, as this will help them with start-up and continuity capital. Above all, they must stay informed and hold on to God. He, thereafter, presented certificates to the Adult Literacy and Skill Printing & Batik students. Mrs. Adeola Akomolede gave the third speech. She asked the graduating students what they planned to do with the knowledge they have just gained. She used herself as an example; she was a branch manager of a bank who also baked. A lot of caterers, hairdressers, event decorators are out there but she charged and encouraged them that what would make them relevant is if they were confident, focused, maintained a mentor-protégé relationship (to not be too proud to ask questions), be all about their clients (“customer-centric”), and have faith in God! She said all these would make them stand out in their trades! After her speech, she presented certificates to the Hairdressing and Decoration graduating students. Comrade Prince Iche’s speech followed. He pointed out that the previous speakers had said most of it all, but encouraged the students to start something now and continue until they became perfect. He told them this was the only way they would reach the destination God was taking them to. He then presented certificates to the Beads and Jewellery-making graduating students. Mr. Yinka Fisher’s speech came next. He stated that a lot of people cry of want and lack because they have not discovered their gifts; he said there was no one without a gift! He invited Mrs. Goodness to the stage; she was a trainee under SMEDAN who now makes sweaters, socks and mufflers. He hoped that CVED would one day soon work with her to include her skill into their training program. He encouraged the graduants to practicalize their trainings to achieve their dreams; told them they would sure make mistakes but they must keep on; they must think big and start small. Mrs. Funmi Nworie, mother of 6 and entrepreneur was invited to the stage next for her speech. She makes and packages juices and beverages. She stated she was glad to see a lot of women graduating, and encouraged her that women can build their families alongside their businesses. She said they should take their skills to business levels; and for evolution they must get information! 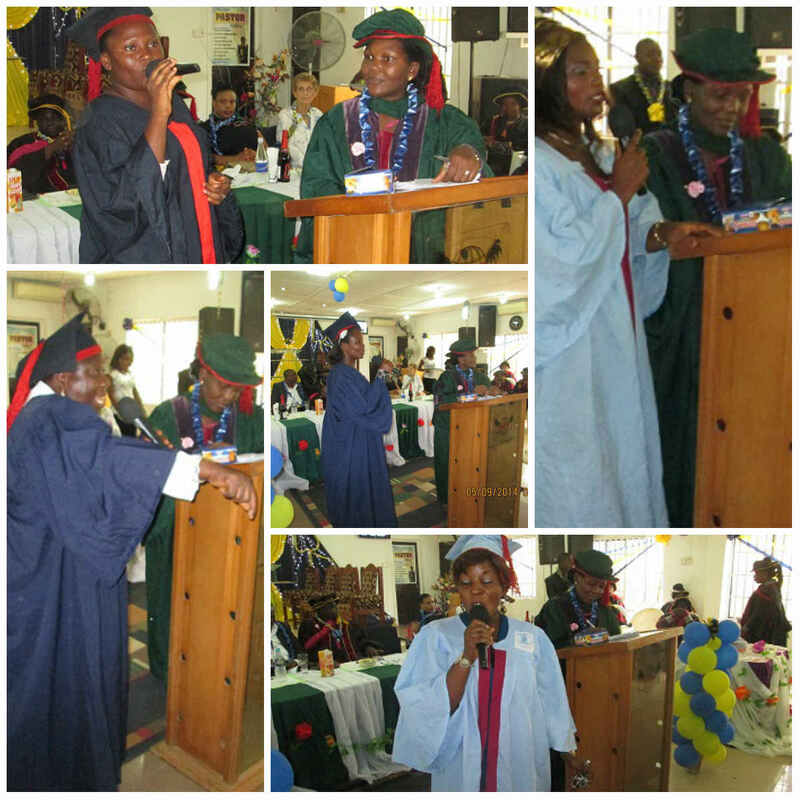 Mr. Fisher was invited back on stage to present certificates to the Make-over and Gele Tying students; and Pastor Jide Esan presented the final sets of certificates to the graduating Catering students. 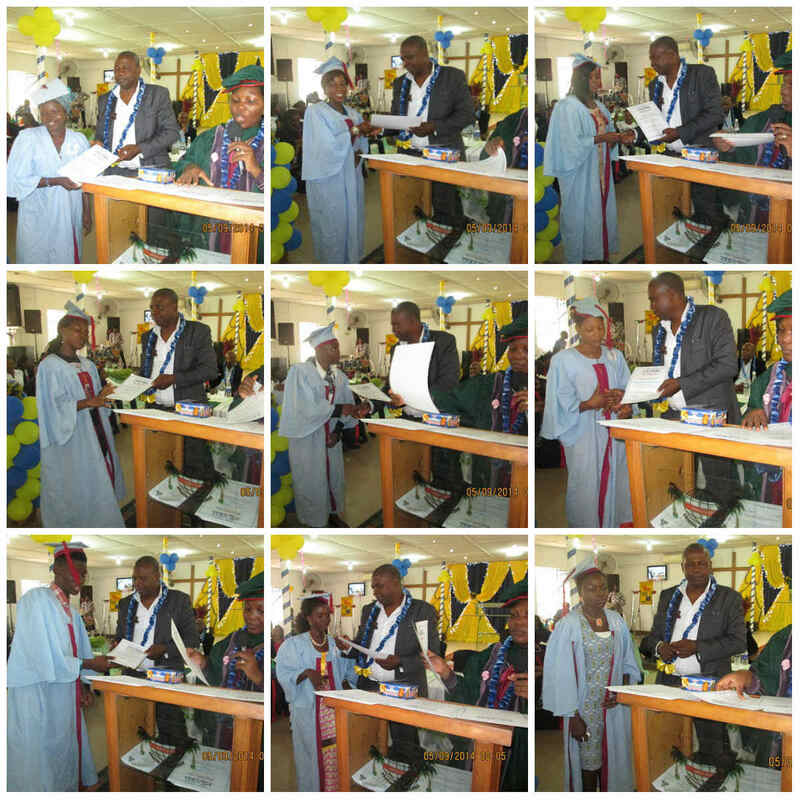 Mr. Damilola Adeoti assisted in presenting cash gifts to the best student of each class. Pastor Jide Esan made the announcements for the next session. New and old students are welcome for the next session that would commence February 6, 2016. Forms would be available from January 12, 2016; registering students are to pay the sum of #1,200 upon registration – #200 for the CVED form and #1,000 graduating fee. Mr. Yinka Fisher did the closing prayer, followed by the national anthem. The event closed on a high praise note, as choir members of the Dominion Faith International Church took the stage! 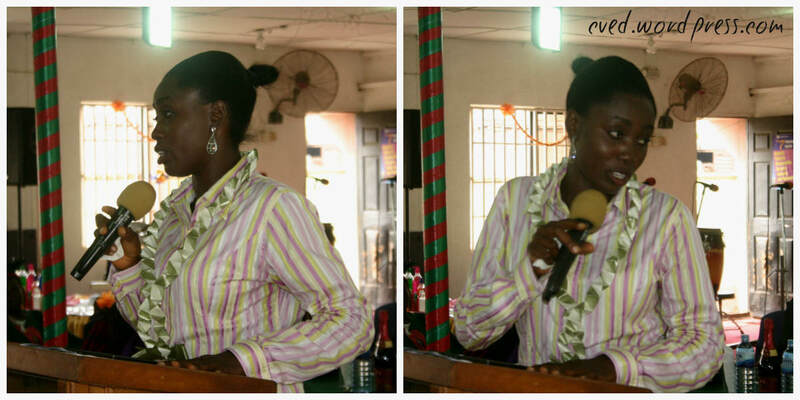 Opening prayer was led by Sister Seun Ajayi at 12 noon which lasted for ten minutes, thereafter Sister Funke Oyekanmi took the opening praise that also lasted for ten minutes. The national anthem followed suit and was led by Brother Solomon Gbadamosi. Brother Kayode Aishida and Sister Seun Ajayi were introduced as the anchors for the day and they welcomed all the instructors, the graduants and all their well wishers to the occasion. Pastor Jide Esan who also doubles as the CVED Coordinator gave a speech also welcoming everybody and congratulating the graduants for the successful completion of their respective vocational training. Thereafter, the Registrar of CVED, Pastor Nicholas on behalf of Reverend David Olatona who was unavoidably absent enjoined the new graduants to start up something with their newly acquired skills and encouraged them to be masters of their trade. The Coordinator, Pastor Jide Esan gave the first set of certificates to student graduants in the Adult Literacy, Photography & Videpgraphy and Computer Appreciation classes. The first speech was delivered by the Key Speaker, Mr. Tunde Fasanya and he firstly appreciated Rev. David Olatona for the opportunity given to him; he also appreciated the grace of God on Rev. David Olatona and the love he has for people in seeing them being employers of labour and economically self-sufficient, which is a rare trait in men. 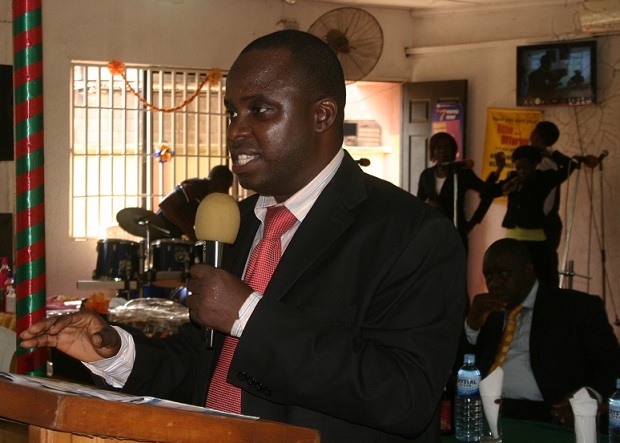 Mr Fasanya’s message to the three hundred and four (304) graduants centered on DILIGENCE. He urged them all to believe in God and be steadfast in prayers, assuring them of God’s provision if they make God the CEO of their respective chosen fields. He emphasized on the need to be practical in one’s dealings, advised them not to be rude to their customers because when they do, they lose that particular customer to a rival; he told them to be humble at all times even when pushed to act otherwise. He advised them not to wait till they have a huge sum of money before they start up a business of their own, urging them to start irrespective of how little the cash at hand may be. Finally, he told the graduants that their success doesn’t depend on their religion, culture, background, race or any of such factors but that their success lies in their own hands. 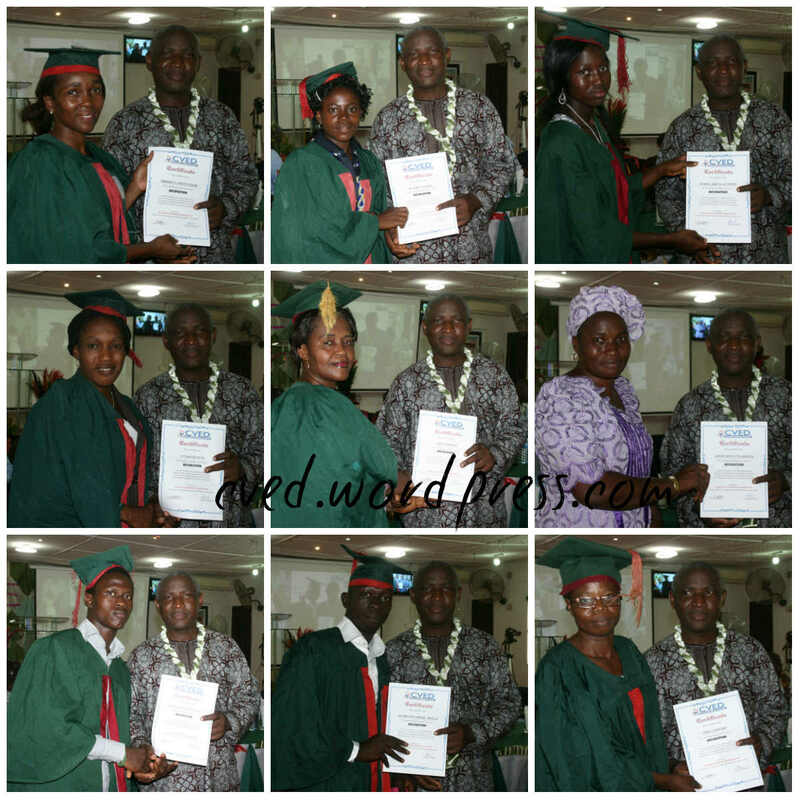 He presented certificates to the Beads & Wire-works and the Screen Printing student graduants. The second speech was delivered by Comrade Iche and he majored on ATTITUDE. He made them understand that attitude helps them in keeping their clients; also talked about the importance of sacrifice, citing Abraham as a sample and also about the need to invest gainfully. He told them to make God a part of their lives and if they do, their business story will change. He also said to them that it doesn’t matter how many people is in the same business with them, they should strive to add a personal touch to their own thing. 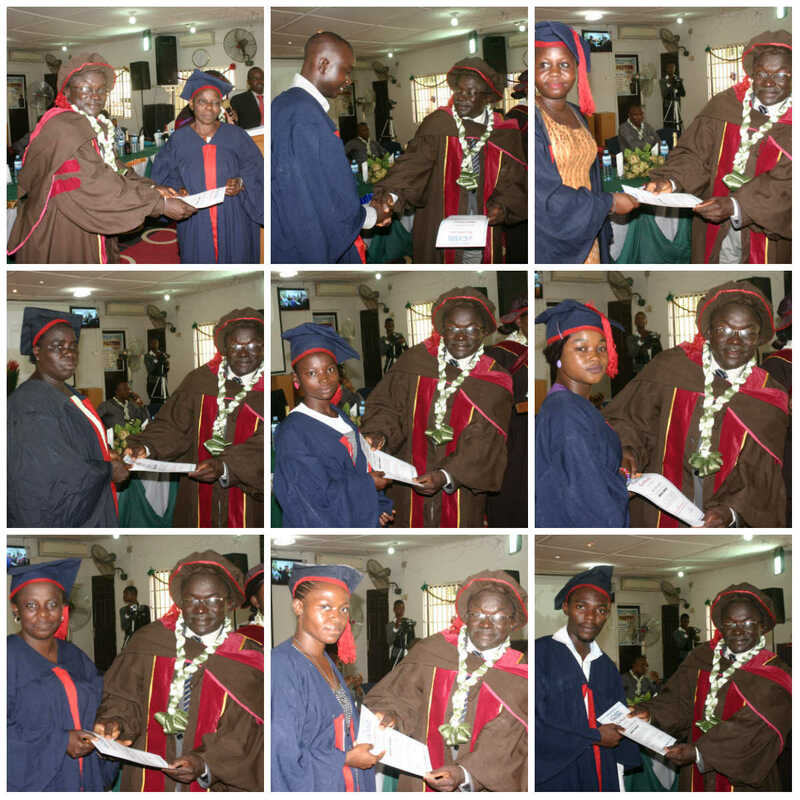 He presented the certificates to the Decoration & Hairdressing and also the Makeup & Headgear Tying student graduants. The last speech was said by Mr. Goldman Kalu, he advised them not to hide/bury their talents/skills and that the skills they have acquired should be applied with diligence for them to go far in life. He urged the parents present amongst the graduants to take care of their children/wards and be sensitive where they are concerned, so as to be able to identify signs of abuse. He presented certificates to the Home-use Chemical Production student graduants. After the speeches, Pastor Jide came up to inform the attendees and guests on the upcoming new session. The new session is to commence on the 25th of September 2015 and it is going to run for 12 weeks; the registration forms will be out for sale from the 16th of September 2015 and for the first time since the inception of CVED, the forms will be sold and will sell for a token of #100. He also told the attendees that the 18th session will be for people who have not participated and benefited from CVED ever since its inception and urged those present to invite their friends and family to come partake of this opportunity. After this, he awarded certificates to the Catering student graduants. Mrs Fasanya spoke briefly to the graduants and prayed for them that their testimonies would start rolling in; she assisted in presenting the #5000 cash gifts to the best students in each department. The best student in the Chemical Production class received an extra cash gift of #10000 courtesy Rev. Oyediji. Students’ vote of thanks came next and presentation of gifts followed afterwards. Pastor Jide Esan took the announcements and said the closing prayer. The event ended at 3:10 pm. To the glory of God, the graduation was another colourful and wonderful event; we bless God for the lives that are touched through us each session and in every nation we have taken this skill acquisition training to; God bless you all also for being a part of this dream that keeps turning into an explosive reality with each and every student’s life imparted! The Cakes for the day! Some of the students displaying their handcrafts – from MakeUp to Bead Accessories to Headgears! 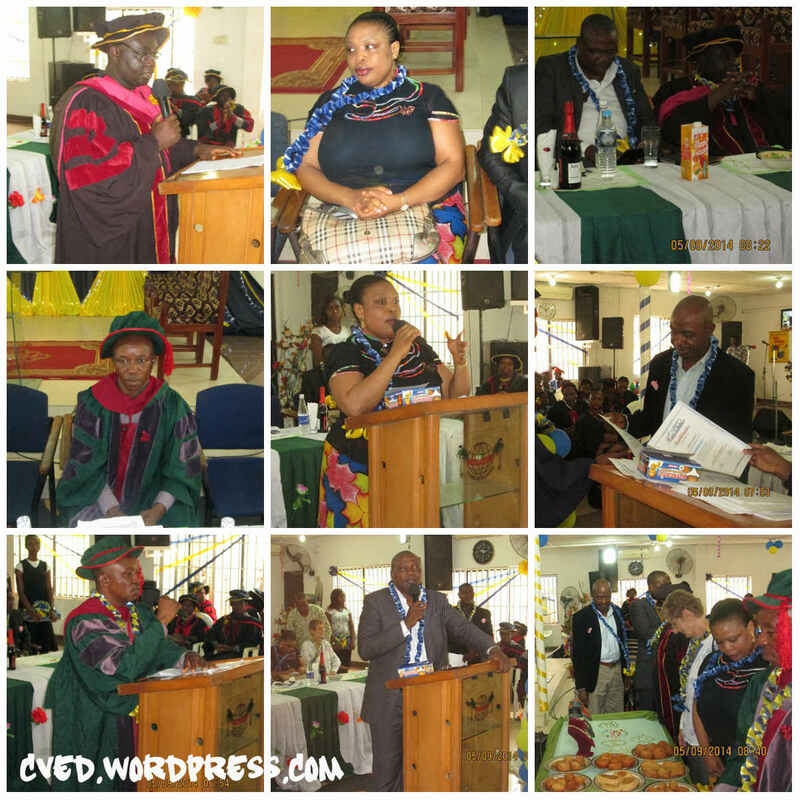 16TH CVED GRADUATION: SEED SOWN FOR TRANSFORMATIONAL LIVES! 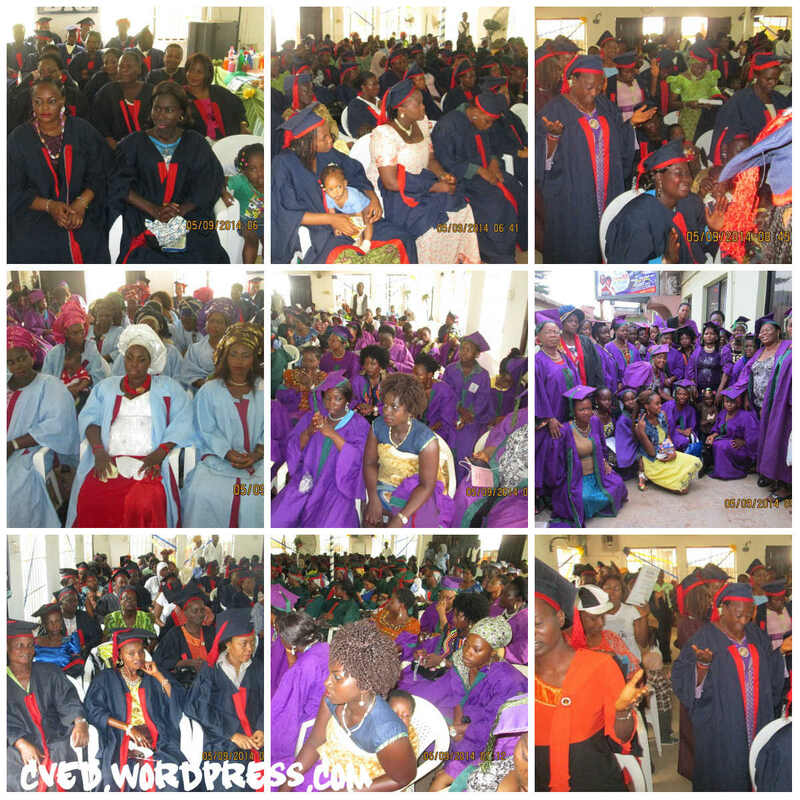 The 15th CVED graduation ceremony, to the glory of God, took place on the fifth day of Decmeber, 2014, in the Dominion Faith International Church, Lagos, Nigeria, where the hall could hardly contain the three hundred and fifty-eight (358) graduants and their guests. Invited guests of honour and speakers included Pastor Uduokhai (of the Dominion Faith Int’l Church), Engineer Olaoke (representing Rev. Oyediji), Comrade Prince Saviour Iche (President of the Association of Micro Entrepreneurs of Nigeria – AMEN), Miss Ibiyemi Esan (Member, Board of Trustees of CVED) and Mr. Yinka Fisher (of Small and Medium Enterprise of Nigeria – SMEDAN). Pastor Uduokhai gave his speech on including God in everything you do, including your businesses. After his speech, he presented certificates to the fifty-five (55) graduants in the Events Decoration department. Engineer Olaoke, shortly afterwards, spoke on how skills pays the bills; he presented certificates to thirty-five (35) graduants in the Home-use Chemical Production class. Comrade Prince Saviour Iche also gave his speech on business strategy, sincerity in business dealings, starting with your small ideas now, practising all the students had learnt and involving God in all they do. Afterwards, he presented certificates to the eighteen (18) graduants of the Hair-dressing class, twenty-three (23) graduants of the Batik and Screen-Printing department and twenty-four (24) graduants from the Computer Appreciation & Desktop Publishing class. Miss Ibiyemi Esan gave her speech and started by saying that “the first key to succeeding in life is believing in yourself”. She encouraged the students to believe in their dreams, be ready to succeed, be a person of integrity and above all, realise that they need God and then others to succeed in life. She then presented certificates to the nine (9) graduants of the Adult Literacy (Basic and Advanced) classes and fifty (50) graduants of the Bead-making and Accessories class. Pastor Jide Esan (Co-ordinator, CVED) then introduced Mr. Yinka Fisher, who also gave a short speech on how self-employment is the best way to go now in our nation, and that SMEDAN is ready to assist graduants who can come up with satisfactory business plans. 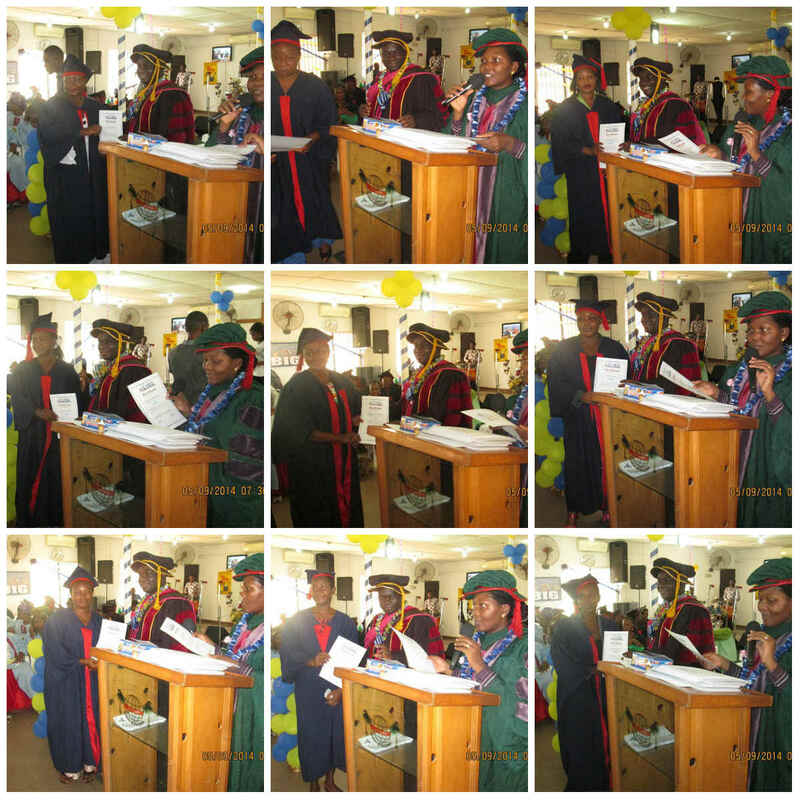 Mr. Fisher then presented certificates to the forty-seven (47) graduants of the Make-Over and Head-Gear Tying class. In conclusion to the speech and certificate-presenting session, Pastor Jide presented certificates to the ninety-seven graduants of the Catering class. 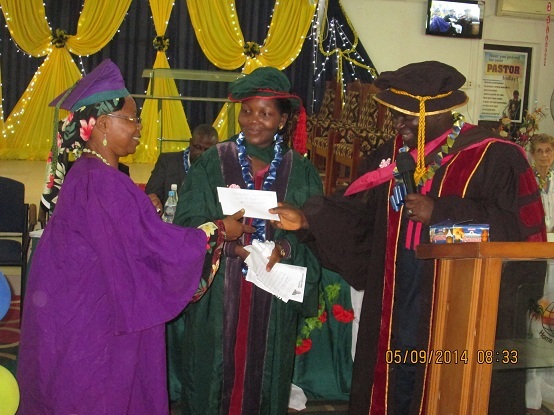 Miss Ibiyemi Esan and Pastor Jide Esan also presented cash gifts to the emerging best student in each department. Representatives from each department came forward to give their vote of thanks to their instructors and organisers of the skill-training programme; after which Pastor Jide took announcements on when the next CVED registration and classes would begin. The national anthem was sung, closing prayer was done, and the event came to an end. 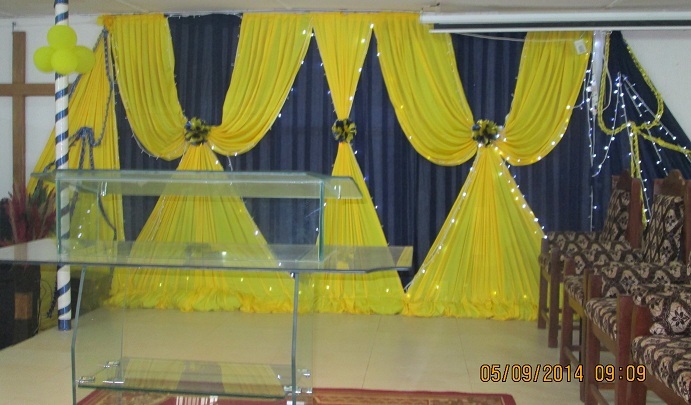 The program started officially at 12 noon with opening prayer taken by Mrs. Sibigam and the praise/worship session taken by Mrs. Favour Sunday. The National Anthem was taken by the choir and the master of ceremony, Pastor Muyiwa Adedina took over the event. Praise Session. The graduands’ hearts seem to be filled with joy! 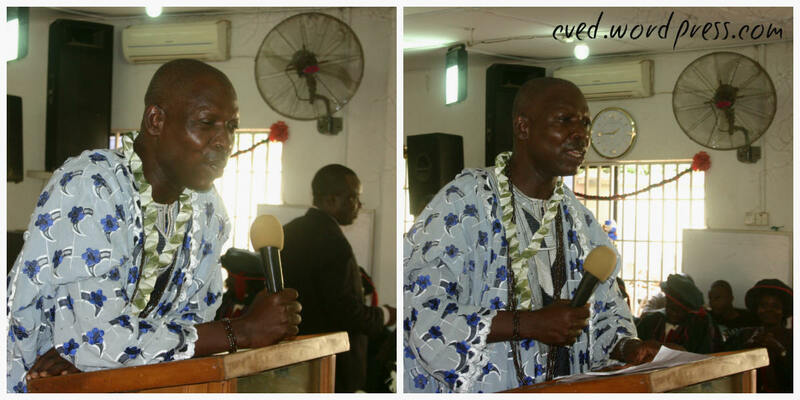 The welcome address was taken by Pastor Jide Esan (Coordinator of CVED). He started by stating that many of the certifications we have from schools is now being augmented by vocational skills. He expressed gladness that we’re beginning to take what belongs to us back again. He listed the programs being undertaken by CVED and also expressed pride that thousands are already reaping the benefits of CVED. He also stated that the programme cuts across ethnicity and religion but all that is required is a “WILLING HEART”. He rounded up by saying that the next session resumes in September 2014, and that the organisation’s driving force is to see the people connecting to their destiny in order to impact their world positively. The MC announced with pride that three hundred and twelve (312) graduands will be graduating in this 14th session and then proceeded to announce the various instructors. The Executive Director, Rev Mrs. Dele Olatona gave her speech at the event. She started by talking about the history of CVED which started from FEEDS and how the church had decided to move people from just free lunch to being able to make their own living. She heartily congratulated the graduands for their efforts and also appreciated the instructors for helping the students see their programme to a successful conclusion. She then challenged the graduands to go out there and prove themselves and to impact their worlds. She told them to be full of integrity and have the fear of God. She urged them never to sell their integrity no matter the cost because the world is waiting for them no matter how small their impact, it’s still very important. 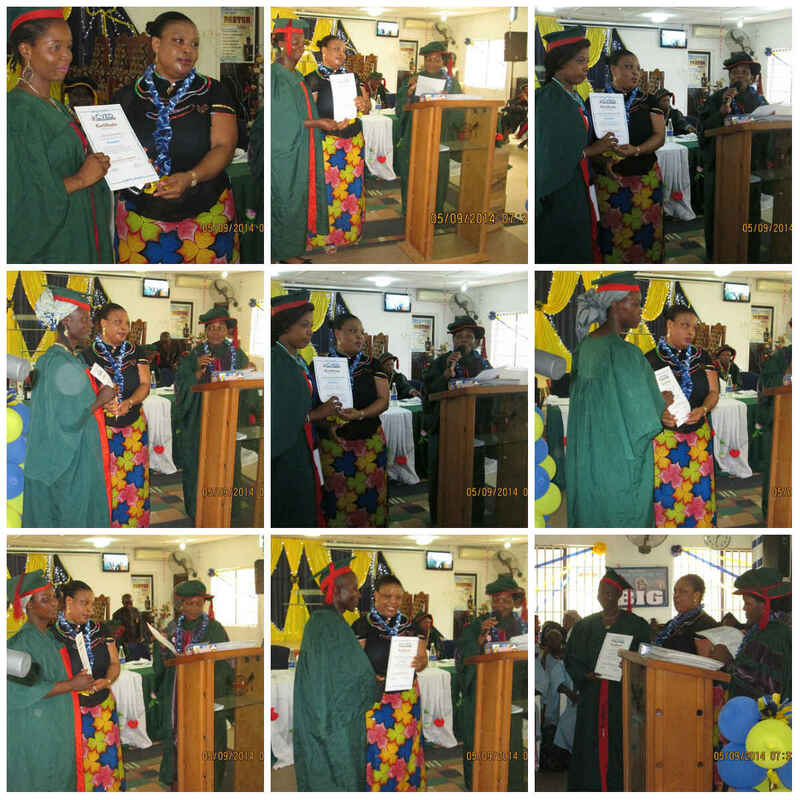 After her speech, the certificate presentation began with Pastor Mercy calling twenty three (23) graduands of the COMPUTER class and Comrade Prince Saviour Iche presented the certificates. 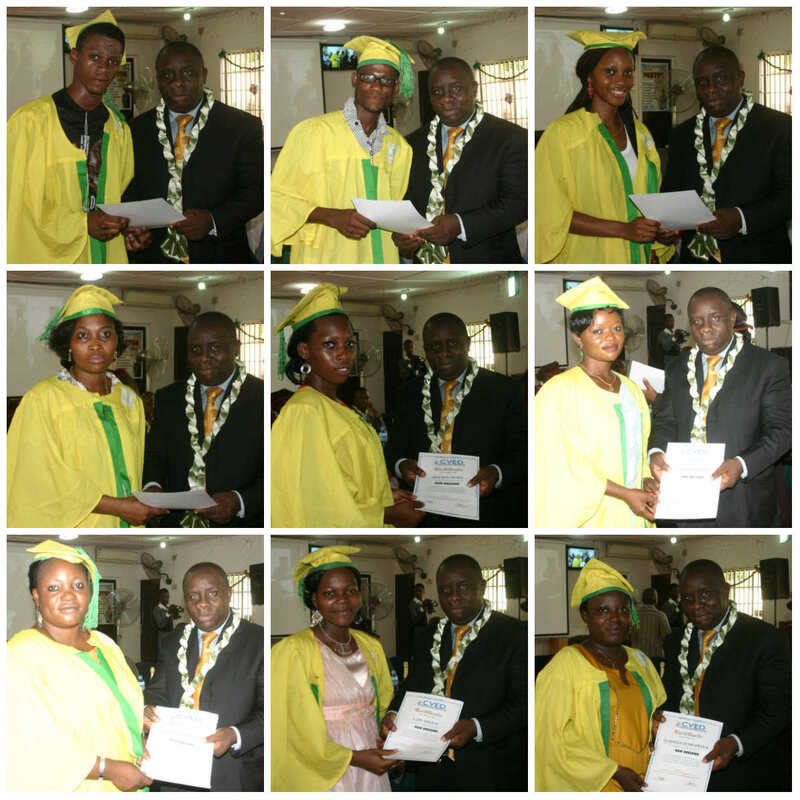 Thereafter, the graduands from the HAIR DRESSING class were called to receive their certificates. They were twenty (21) in number. After this, Comrade Prince Saviour Iche was called to give his speech. He assured the graduands that he’s available to help those in the manufacturing sector. He told the graduands that the training they have gone through is what is needed in the country especially with the high rate of unemployment now. He encouraged the graduands not to be discouraged with whatever business they may have done before but to apply themselves to all they have learnt so that they will succeed. He charged them not to look at the problems they will face but to believe in themselves and what they have learnt. He challenged them to start NOW and not tomorrow. After the speech, Deaconess Ikusika was called to present certificates to thirty-five (35) graduands of DECORATION class and twenty (20) graduands of PRINTING/ADIRE class. Mrs. Ikusika was asked to address the graduands and she advised them to rely not only what they’ve been taught but to seek to improve knowledge. She also asked them to go online if need be to improve on what they’ve learnt. Thereafter Mrs. Ayanwale was called forth to present certificates to forty-five (45) graduands of the MAKE UP/HEAD GEAR class. 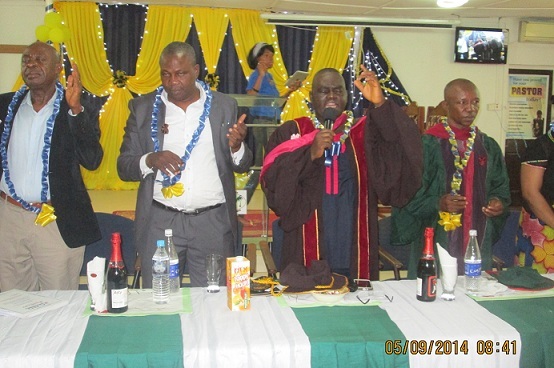 Rev Dr. Gabriel Oyedeji was called to present certificates to thirty-five (35) graduands of CHEMICAL class. He also presented certificates to forty-five graduands in BEAD MAKING/WIRE WORKS class. 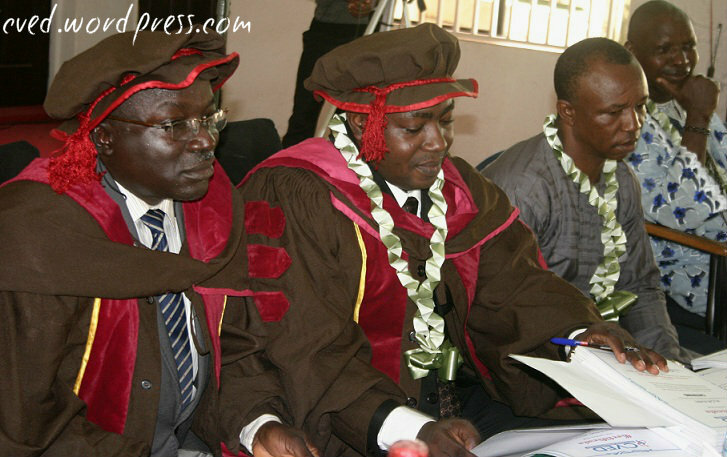 Rev Oyedeji, in his speech to the graduands, congratulated the church for a laudable project. He said the problem we have in the country now is not Ebola or HIV or Boko Haram but it’s the problem of the environment. He stated that people are now being self-centred and are not taking responsibilities. The country is not taking responsibility of its citizen either. He said it is obvious the system of this world can no longer sustain the people, hence the need for people and organization to take the role of social environmentalists. He encouraged the graduands to keep improving themselves and to do all they can to improve their immediate environment. He enjoined them to start small and keep growing themselves and their businesses. The goal is to improve their environment and become extraordinary graduates. The MC informed the graduands of two (2) job openings before acknowledging Mrs. Adeyemo the former decoration instructor who also came to felicitate with the graduands. 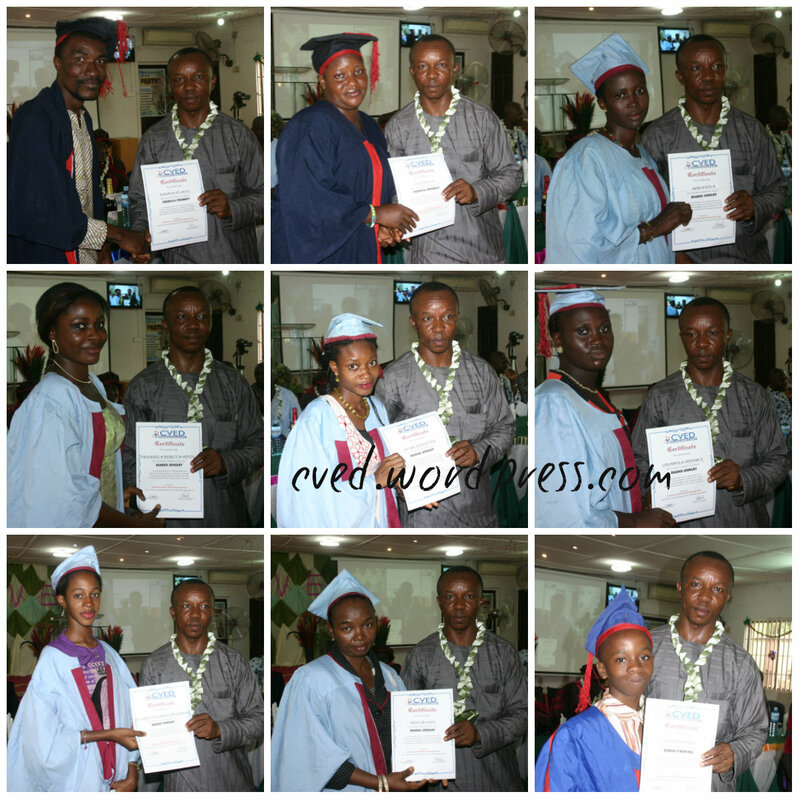 Mr. Yinka Fisher presented the next set of awards to seventy-one (71) graduands in the CATERING class. In his advice to the graduands, he started by saying the era of white collar jobs is gone. He told the graduands they’re privileged to have this training and admonished them not to make light of what they have learnt. He told them they have been receiving information for the past twelve (12) weeks and it’s the job of the SMEDAN to teach them how this information will turn into earning potential for the graduates. He encouraged the graduands to form a cooperative group among themselves and that SMEDAN will be there to help them out. He congratulated the new graduands and the church for the great job done. 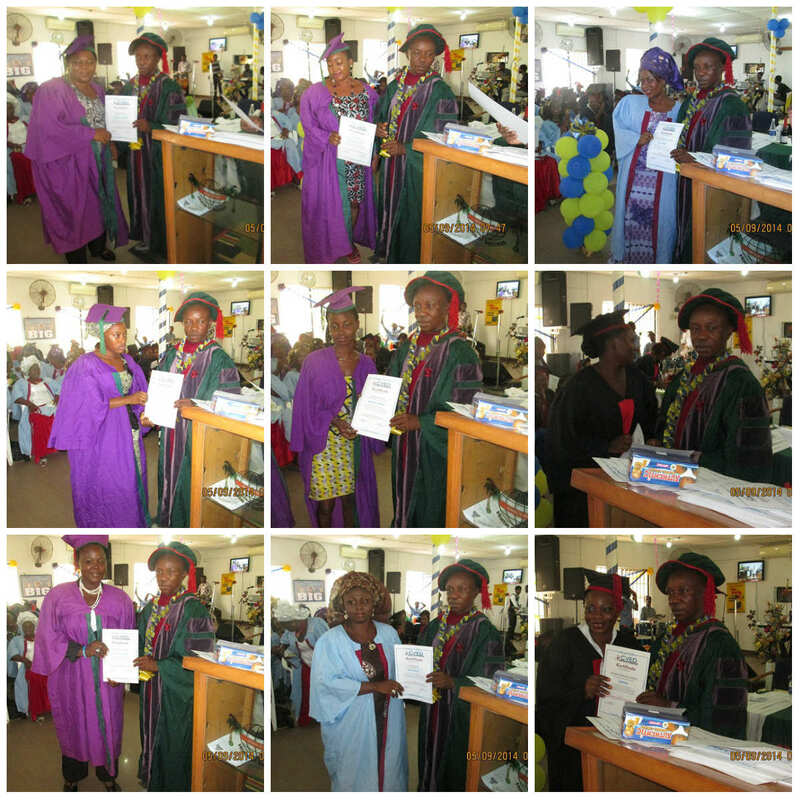 The Executive Director, Rev Mrs. Dele Olatona presented certificates to graduands of the ADULT LITERACY class. After the last presentation of certificates, Pastor Jide announced that the 15th session begins on Friday, 12th September 2014. Forms will be available for collection at the church office from 26th August to 10th September, 2014. He enjoined the graduands and everyone present to always see to it that they wash their hands and keep their hygiene level so as to combat the scourge of Ebola in the country. A representative from each class was called to express their appreciation on how the training has been beneficial to them. In keeping with tradition, awards were given to the best graduating students of each class. Each student was presented with the sum of #5000 as start-up capital. The Executive Director came to address the graduands again by stating that it’s always good to be best because one never knows who might be there to reward. She then called Rev. Oyedeji who spoke of his appreciation for the continuity and consistency of the project and also to present the best graduating student in Chemical class with a sum of #10, 000. The Executive Director in her vote of thanks enjoined all graduands to inform all those around them especially in their neighbourhood to also be a part of the CVED project so they can also learn some skills. She blessed the graduands and joined the dignitaries in inspecting the products and cutting the cake with the best graduating students in each class. The National Anthem was taken as the event was brought to a successful close at 3:15 pm. 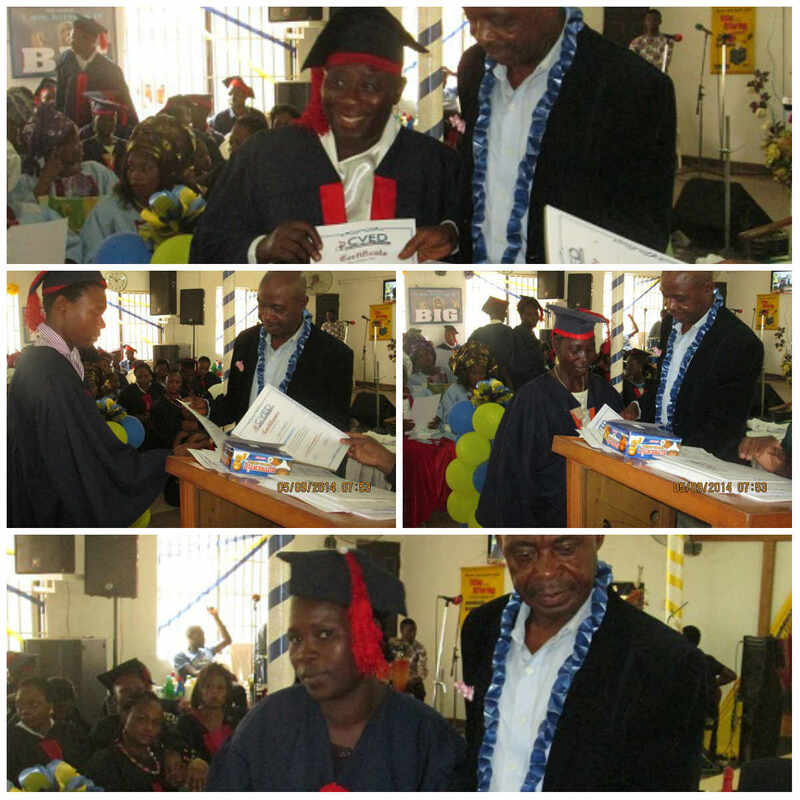 On the 9th of May, 2014, the Centre for Vocational Empowerment and Development graduated the 13th set of students that underwent its skill training programme. 217 students were awarded certificates during this graduation ceremony. The occasion, once again, was graced by a mix of special dignitaries including, Rev. David Olatona, himself (CEO, Centre for Vocational Empowerment and Development – CVED), Rev. Dr. Gabriel Oyediji (CEO GABOYE Investments and President, Compassionate Orphanage,) Mrs. Akosile Abosede (Legal Officer, Small and Medium Enterprise of Nigeria – SMEDAN), Comrade Prince Saviour Iche (President of the Association of Micro Entrepreneurs of Nigeria – AMEN) and Surveyor Kolawole L. Ayanwale (CEO, K. L. Ayanwale & Sons). Also present were the instructors for each class; Pastor Mercy Esan (Adult Lietracy Instructor), Mrs. Funmi Alonge (Catering Instructor), Mrs. Hannah Adedina (Decoration Instructor), Miss Funke Adesegun (Chemical Products Instructor), Mrs. Hadeza Omotayo (Make-up & Head Gear Instructor), Miss Blessing Ajayi (Hairdressing Instructor), Mrs. Josephine Chukwuma (Beads & Wire Work Instructor), Mr. Oladeji Showunmi (Computer Appreciation Instructor) and Mr. Ayo Oyekanmi (Screen Printing & Batik Instructor). The Adult Literacy Class that sees to instructions on alphabets, spellings, construction of simple sentences, compositions, reading and writing and so on, graduated four (4) students. The Beaded Jewellery and Wire Works Class that instructs on making accessories such as necklace, ear rings, belts, bags, purse and so on, graduated twenty-five (25) students. The Catering Class that teaches baking, cooking, frying of various foods such as different rice meals, small chops, burgers, snacks and so on, graduated sixty (60) students. The Chemical Class that focuses on teaching how to make chemical products such as air freshener, cold water starch, stain remover, toilet wash, body and hair cream, insecticide, liquid soap and so on graduated forty-one (41) students. The Computer Class that takes care of lessons on introduction to computer, desktop publishing, usage of applications such as Microsoft Word, Excel, Power Point and so on, graduated fourteen (14) students. 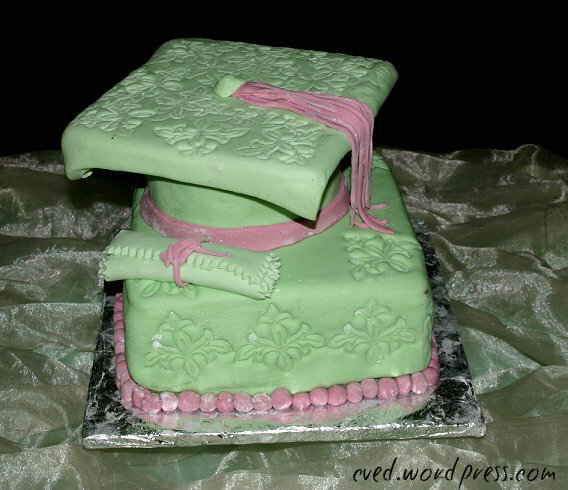 The Decoration Class handles instructions on ribbon, cloth, table, balloon, floral decorations and event planning. Twenty-four students (24) graduated from this class. The Hairdressing Class that handles lessons on weaving, washing, rolling and setting, re-touching, braiding of hair and so on graduated nine (9) students. The Make-up & Head Gear Class takes lessons on bridal make-up, facial therapy, head gear typing, fixing of artificial eyelashes and so on; and it graduated seventeen (17) students. The Screen Printing & Batik Class that focuses on lessons on screen printing, coating, exposure, sticker and T-Shirt printing, and so on graduated twenty-one (21) students. The dignitaries assessed the finished products displayed by the Beads, Catering, Printing and Chemical Classes. Representatives from each class did vote of thanks, to their instructors and also to the people that made the free skill acquisition programme possible; expressing their profound joy and gratitude for the opportunity and ability given to them that has helped them become entrepreneurs, regardless of their religion, gender or age. 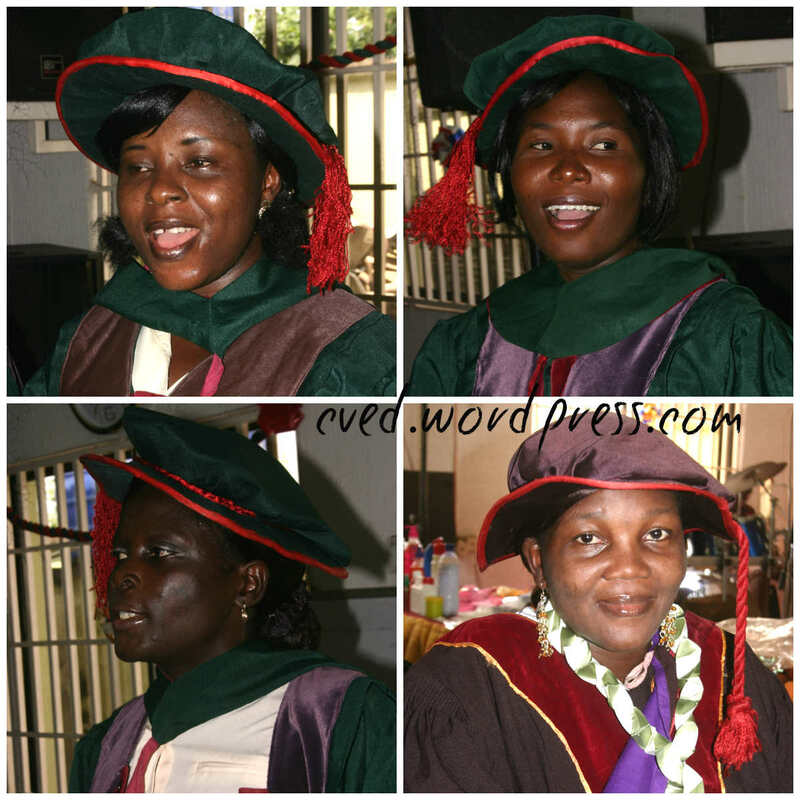 As the graduation ceremony was about to end, the CEO of CVED – Rev. David Olatona – stating that he intends to take the project to the next phase where soft loans can be given to students to help start their business, gave out a sum of five thousand naira each (N5,000) to seven students. Rev. David Olatona did the closing prayers; the national anthem was sung, and the graduation ceremony on that note came to an end. By God’s grace, it was another colourful and successful event! From all indications, one of the objectives of starting the CVED project is being attained – raising entrepreneurs and ethical leaders. 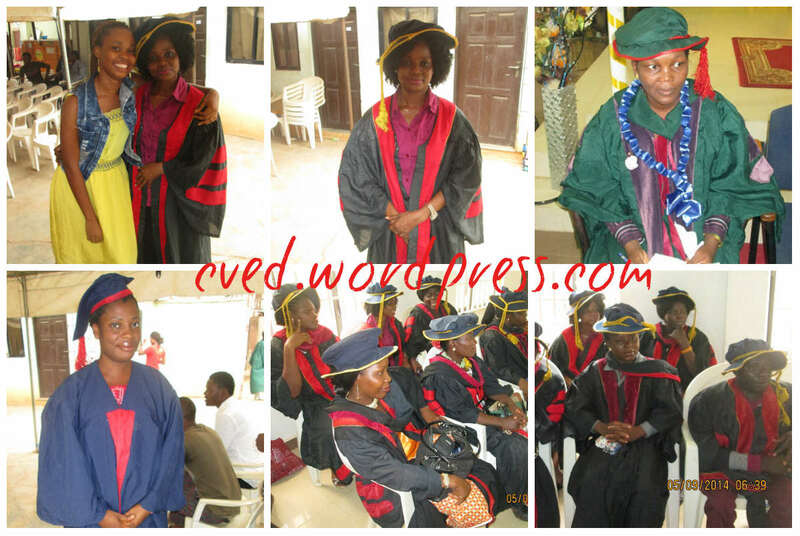 Another set of CVED students graduate once again – the 12th set, to be precise; in their colourful graduation gowns and caps, with huge smiles on their faces and certificates in hands. Quite a number of students graduated from different classes. 14 students graduated from the Printing class; 17 students graduated from the Computer class; the Event Decoration class graduated 49 students; 23 students graduated from the Bead-making class; the Catering class graduated 59 students; the Chemical Production class graduated 61 students; and 14 students graduated from the Hair-dressing class. The occasion was graced by several dignitaries including, Dr. Jeremiah Yongo (Partners Worldwide), Chief Oladele Alonge (Baale, Omila-Alawode), Miss Bimbo Williams (Renowned Event Decorator), Mr. Yinka Fisher (SMEDAN – Small and Medium Enterprise of Nigeria), Prince Saviour Iche (President of the Association of Micro Entrepreneurs of Nigeria – AMEN). At the end of the day, over two hundred and thirty (230) students graduated! More graduation pictures and reports on the CVED website!